In honor of Scoliosis Awareness Month, I am going to help you all understand what it truly is, and how to check for it and treat it. Do you know what Scoliosis is? It’s when your spine is abnormally curved. Your spine, being your back bone, is generally straight even though many people have a slight curve that doesn’t affect you. 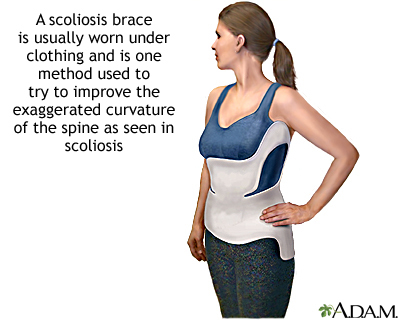 But Scoliosis is an extreme curve that is either visible to the naked eye, or very noticeable in an X-ray. Most of the time, the cause of Scoliosis is unknown(idiopathic). Scoliosis can affect about 2% of females and 0.5% of males. There are different types of Scoliosis, it all depends on what age it develops. It can start as early as age 3 in young children and develop at any age after than. 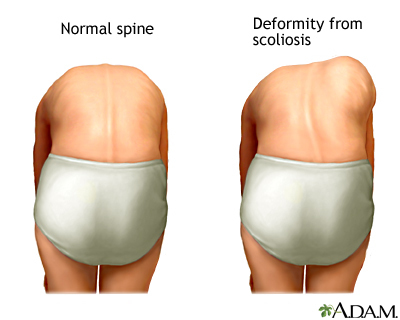 Congenital Scoliosis is the type of Scoliosis is present at birth. It occurs when the baby’s ribs or spine bones do not form properly. Neuromuscular Scoliosis is when there is a problem when the bones of the spine are formed. Either the bones of the spine fail to form completely or they fail to separate from each other during fetal development. This type of Scoliosis develops in people with other disorders, including birth defects, muscular dystrophy, and cerebral palsy. There is also degenerative Scoliosis, which is where, unlike children and teens, it develops in older adults. Caused by a change in the spine due to Arthritis, or weakening of the ligaments and soft tissues around the spine. You will be asked to bend forward. This makes your spine easier to see. It may be hard to see changes in the early stages of Scoliosis. Treatment for Scoliosis is tricky as there are many factors to look at. But usually it’s either observation, using a brace, or surgery. Functional Scoliosis where there is an abnormality elsewhere in the body, is usually fixed by treating the issue causing the curve of the spine. Neuromuscular Scoliosis is usually treated with surgery since this type of Scoliosis gets worse over time. With Idiopathic Scoliosis, depending on the age of course, the Doctors usually start off with X-rays and a brace. It is most common in teens in hopes to prevent the curve from getting worse until they stop growing. Even though I was a teen when they found my Scoliosis, they started off observing me. I would get an X-ray done every 3 months. Turns out I was curving at a rapid rate where the brace would not be effective in my case, so they opted for surgery. They told me the surgery would be life changing. Due to my personal case, I would be not be able to do A LOT of my normal stuff like run. 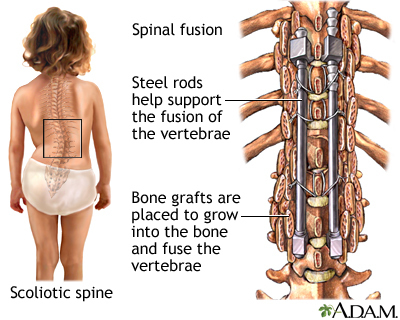 When surgery is needed, its called a spinal fusion. This is done with a combination of screws, hooks, and rods that are attached to the bones of the spine to hold them in place. The surgeon places bone graft around the bones to be fused to get them to grow together and become solid. This prevents any further curvature in that portion of the spine. In most cases, the screws and rods will remain in your spine and not need to be removed. I had more than one of these done to my back. Because of the car accident I was involved int, it shifted everything and my spine was greatly affected. They tried a few times to try to repair the damage with no success to the point that in my adult life I couldn’t handle the fusion pain anymore. I have gotten all the rods, screws, and hooks removed. I still have A LOT and I mean A LOT of pain that affects me every single day with each activity I do. Personally, I would find other ways to correct the problem rather than do surgery. With how advance technology is now a days I have seen other forms to help Scoliosis fighters rather than fuse them up. My first surgery experience was scary to say the least. 14 hours spent in the operating room, and months of recovery. Learning how to walk again, sit, stand, shower, sleep, EVERYTHING. One of the most important things is to have support of family and friends!!! Recovering from a major surgery like that isn’t easy and it was the toughest thing I had to do….4 times. I wanted to write this and let you all know the severity of Scoliosis and hope you all get your children checked and opt for that routine school screening. Catch the problem before it’s too late!!! If I had known better, I am pretty sure my life wouldn’t be as difficult as it is now. I refuse to have another surgery done as I know it will do more damage than anything. Each surgery I had left me with a new pain and a daily reminder of what I deal with. Don’t ignore the symptoms!!! I’m sure you all have had lower back pain at some point so you know how painful it can get. Now imagine that pain ALL over your spine in your teen daughter, or son? I used to be ashamed of my scar and my Scoliosis because it is very visible. My shoulder is higher, my hip is higher, I have a shorter leg, and I have a hump on my back. Many people do stare at me when I’m in a bathing suit and makes me uncomfortable. I rather you ask me why I am crooked like that then to stare and laugh. 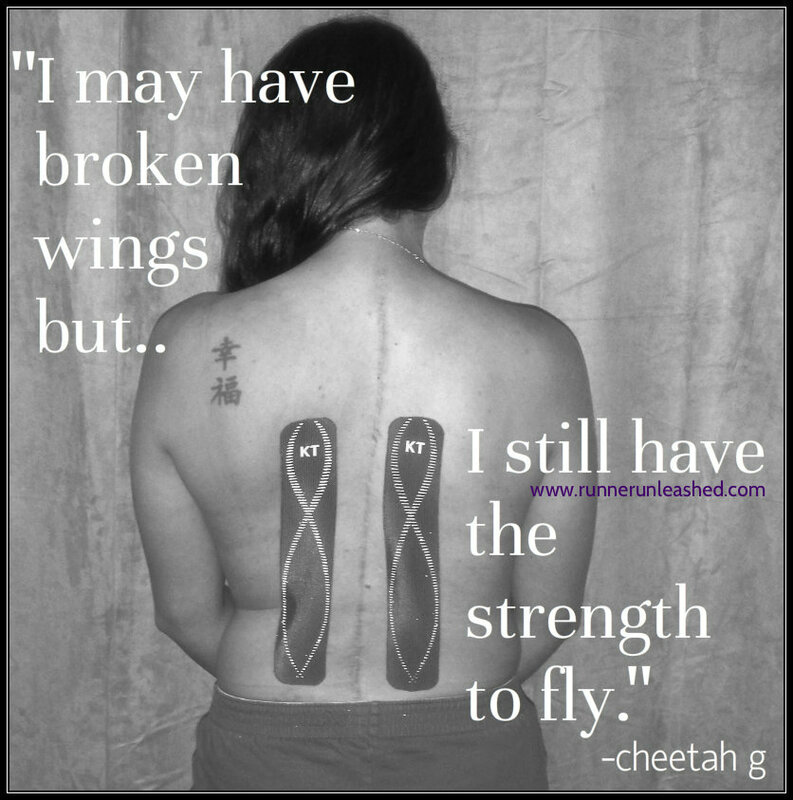 I know many Scoliosis fighters out there deal with similar issues, so I am sharing my story with you and letting you know there is hope to overcome. I still deal with chronic pains, some days worse than others. I do spend days in bed not being able to move due to the severity of the pain, and other days…I am out there running a marathon!!! Don’t give up Scoliosis warriors!!! It’s a tough battle but you will overcome. Be knowledgeable and smart on what you need to do. Don’t ignore it, treat it!!! Even though I would spend months and years doing PT, nothing worked, and I would have CRAZY forms of therapy that made me more uncomfortable with the pain instead of help it. I never wore the brace but was on crutches a lot due to pinched nerves and no feeling in my legs. Today my pain problem is no feeling in my upper right, giving me limited movement in my right arm. Breathing is also an issue, but that is due to how my back is curved where I have limited space in my lungs. Now I actually use this amazing product called KT Tape that helps keep my pain levels low and it lasts for days at a time. 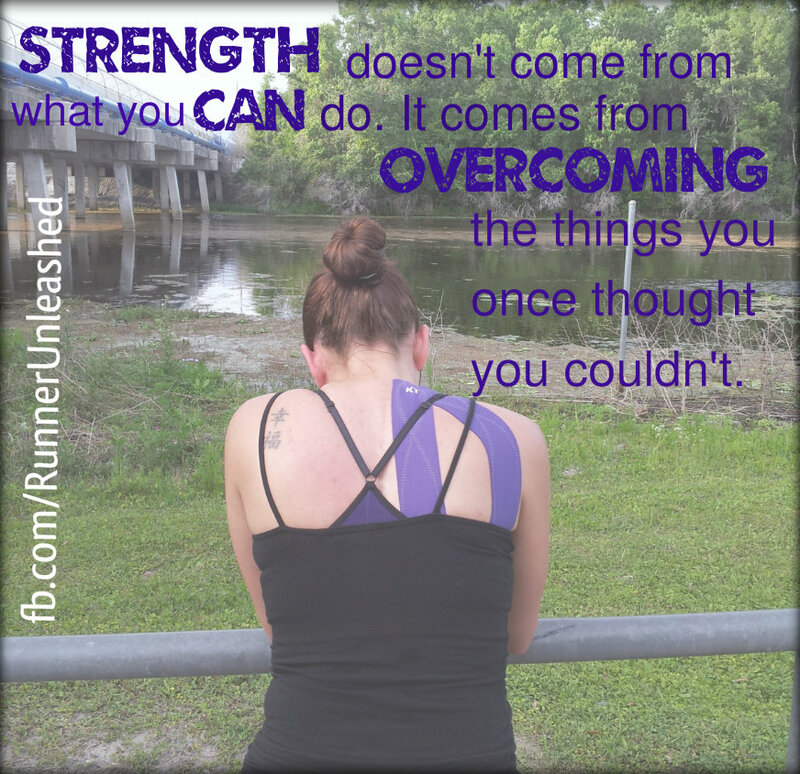 Feel free to ask me any questions about Scoliosis or how I make it my strength when I run rather than my weakness. I wasn’t always a fighter, I wasn’t always this strong. I learned to let go of things I couldn’t change and do something about it. I no longer hide behind my Scoliosis, I share it with the world to let you know you are stronger than you think. Having the support of my amazing husband and others makes it easier for me to continue to beat my deformity! I literally am beating it one step at a time. My goal was to become a marathoner and I have succeeded. My next goal is to run a faster half marathon, and tackle the 39.3 miles Goofy’s Race and a Half Challenge!! I will continue to run to prove to myself that I am strong and I can do it. I refuse to be told I am too weak!!! 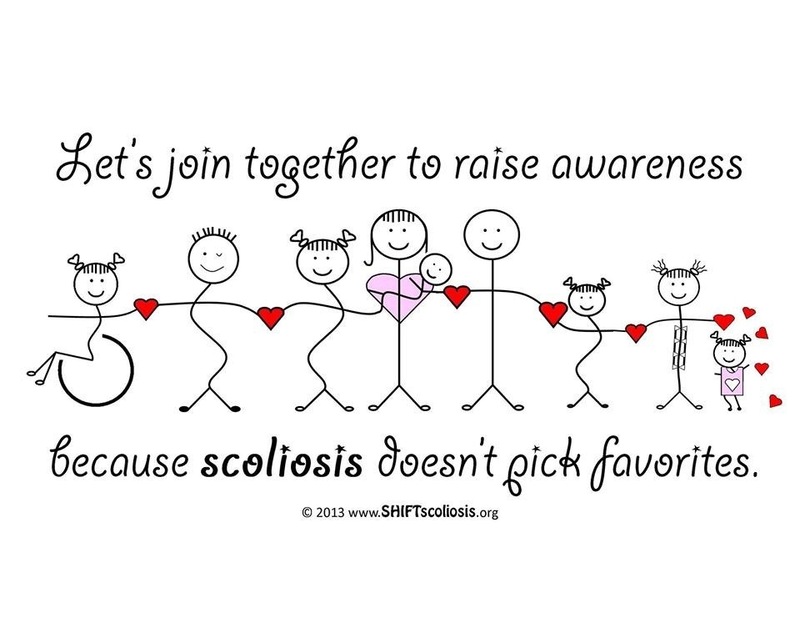 Keep fighting Scoliosis Warriors!!! I applaud you for your strength and determination to rise above scoliosis. You’re a true warrior and an inspiration. You are so awesome! Beyond your message about screening, is your message about not giving up on what you love to do. Beautiful post… thank you for sharing your story. I so admire you and your determination! I love and admire the courage you have to keep going despite your discomfort. 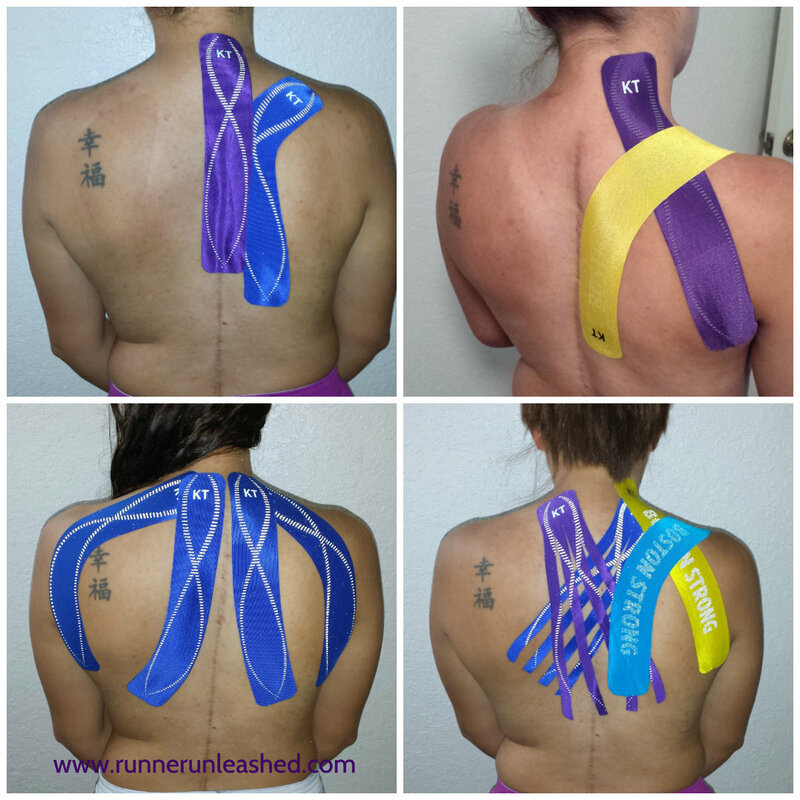 You have a much deeper relationship with scoliosis, and I sense that it is NOT easy for you. You are such an inspiration! Thank you for your kind words, and understanding exactly what I was trying to say. I am with you on the hump and ribs. I start to cramp EVERY TIME on my hump side on my ribs because I am limited to breathing room but I keep going =) I can’t sit or stand for too long as it causes discomfort.. But I figured I’d stand up against Scoliosis and fight it!! I no longer hide! I too have scoliosis. I went to PT for several years as a child and got grim prognosis from doctors I’ll be in a wheel chair by 35 (I’m now 40). Mine is causing severe SI join pain as well as a hump on the back of my neck where my head slumps forward due to the fatigue in my back, more so when I run longer distances and my form starts to suffer. Lately I’m also experiencing numbing sensation in my arm, a new development in this scoliosis journey. Like you I love running and do not want to give it up. I have only ran half-marathons, spending 4 plus hours on my feet doing a full marathon seems daunting. But reading your story made me realize I can push through my scoliosis and tackle a full or maybe even an ultra (which is my dream). Thanks for being so open about your journey and an inspiration to us all. WOW Patty! Thanks for sharing your AMAZING story! I love your attitude and determination! I will say running the marathon was tough for me as I am NOT a fast runner, and at mile 20 I did start to feel tired, it took me close to 7 hours to run it =/ But I did it and I signed up for a 39.3 miles challenge!!! I also want to run an ultra one day…just havent gotten there yet. Keep me posted on your journey, I’d love to hear about it!!! This post is very informative and inspiring at the same time. 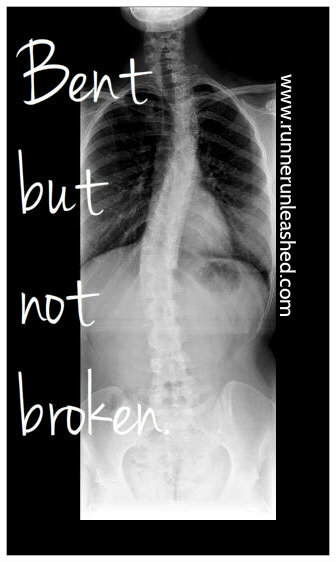 I don’t think a lot of people are aware of what it is like to have scoliosis . I’ve been doing research about scoliosis and other spine problems recently and based from what I’ve read so far I can only imagine how hard it is to have this kind of condition, I want to applaud you for your bravery in conquering this challenge in your life. You are an inspiration not only to people with scoliosis but also to everyone that is facing any type of difficulty in their life, You’re proving that nothing is impossible if you put your heart into it. Thank you so much sir. It’s the reason I share my struggles. I want to inspire and shown others that you don’t have to be the “perfect” runner to be successful. All you need is heart, determination, and a never give up attitude and you’ll reach your dreams. Thank you so much for sharing! I have mild scoliosis and I definitely feel some pain when running. 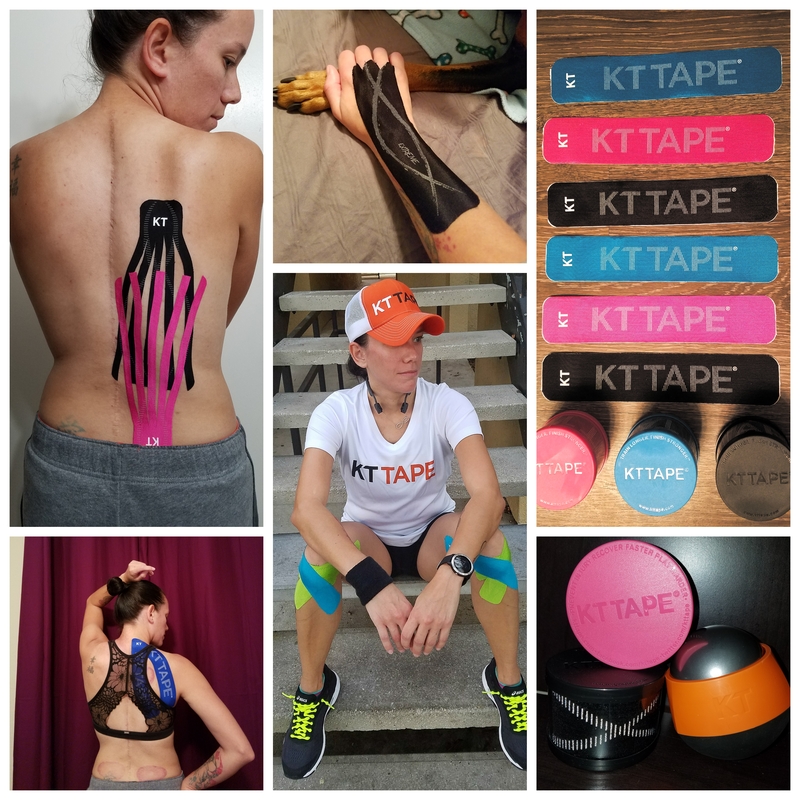 I will definitely look into KT tape. What an incredibly uplifting and inspiring post to read! Despite all of your hardships and limitations glu have STILL found the positives. I love the stripe versus scar reference! I was told I have mild scoliosis years ago but never looked into it. Just started getting into jogging and had to stop due to back pain. Hey! So I realize this is an old post, but I got a bit misty eyed reading your story- I’m blown away by your strength. I also have scoliosis- an S curve that is most prominent in my upper right shoulder, giving me the “hump” as well. I also recall the stares and laughs which were so hard to take as a child (I was diagnosed at 4 and braced by 5). Anyways, i never had surgery, so I can’t even imagine that pain! 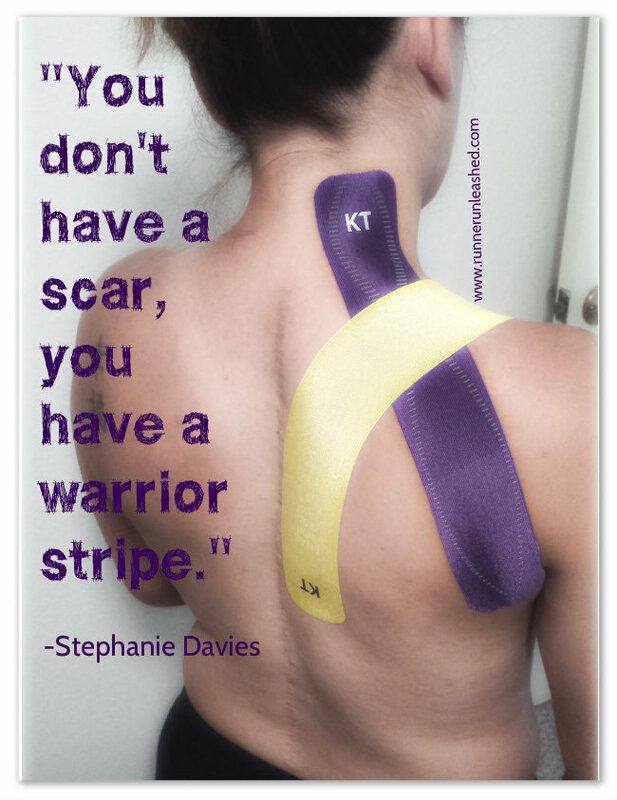 But my back still causes me intense pain almost daily., and i have trouble breathing while running (crowded lungs) -So I am super keen on trying ktape- sorry I can’t find where you demo the best tape method for upper back pain.. Any tips? I know this post is super old, but I’ve been reading your blog in its entirety and I must say you are a hero! Very very inspiring. I hope you feel better and may you live peacefully through the pain. I wanted to ask you… my boyfriend suffers from mild scoliosis and his daily life is perfectly normal, but running makes him hurt afterwards. It goes away after a few days. Do you know if KT Tape would work for him when running? His pain is usually in his lower back, but we haven’t found an app that might be helpful. Thanks! Hey Andy, yes KT Tape will help. I use it daily for my Scoliosis pain. Hi ,your story is amazing. I had aspinal fusion in 2014 ! And i’m happy to find your blog , Ido track and field too . I can’t run like i used do but thank god i’m able to run. Even though i still Have pain on my lower left side. I Try to Be patient but it’s hard ! Kisses from France 😘. Hey Mary! I am glad you found me! And I’m even happier you still are running and doing what you can! Hi, thank you for sharing your story! I’ve had scoliosis for a very long time and it has been very painful in the past. I was very lucky because six years ago I found someone has a technique to cure scoliosis and I’ve slowly been getting better. I no longer have the pain I used to. In any case I’m so sorry to hear that it is still painful I fully understand. The person that helped me lives in Spain, she’s Argentinian and goes back there too. so I don’t know if it would be much help to you but I found the sessions not to be that expensive and worth while considering the pain I was going through but I live in Europe. In any case if you want me to tell me more about the treatment I’m doing and my experience don’t hesitate to contact me. Previous Previous post: No accomplishment is too small!